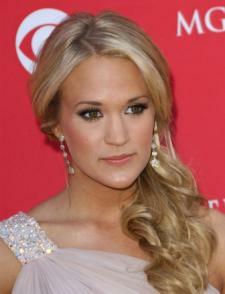 Carrie Underwood hair styles are versatile and popular. Winner of the television competition American Idol, Carrie Underwood has become a well-known country and pop recording artist. 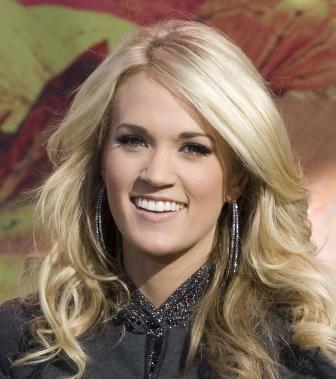 Carrie Underwood's styles have been used as inspiration for many women who want a long, flowing look. There are several different ways Carrie Underwood wears her hair, ranging from elegant updos to wavy long styles. • Long and Wavy: This style flows past the shoulders, and can be enhanced by curling straight hair, unless your hair is naturally curly. • Half-Beehive: Much like the style above, this hair style also incorporates a slight beehive look on top of the head for extra volume. • Flipped Edges: This style is mid-length and straight, with the ends of the hair flipped upwards with a flat iron. • One Sided Ponytail: A wavy ponytail pulled to one side is a common look for Carrie Underwood. • Medium-Length Layers: Whether wavy or straight, medium layered hair styles are a cute look. • Updos: Carrie Underwood often wears her hair in elegant updos for award shows or other formal events. Sometimes her hair is styled in a simple bun, and at other times it is left partially hanging down to frame her face. Carrie's ponytail is an easy formal style. • Dye your hair the same color blonde as Carrie's. Taking a picture with you to your hair stylist is the best way to be sure you get the right color. If you don't want to dye your hair the exact same shade as her hair, then get a darker or lighter blond dyed into your hair as highlights or lowlights, depending on your hair color. • Get hair extensions if you have shorter hair. Since many of Carrie Underwood's hairdos are longer, a shorter cut may not provide ther versatility you want..
• If your hair is naturally straight, invest in a curling iron for the wavy looks that Carrie often wears. If it is curly, then buy a flat iron to straighten it for the layered looks. • Wearing your hair in an updo or a ponytail that is tied to the side is an easy way to model your style after Carrie Underwood's hair without needing drastic changes. Along wth Carrie Underwood hair ideas, there are many celebrity styles to use for inspiration. Singers such as Jessica Simpson and Taylor Swift, for example, have blonde hair styles that are popular. While celebrities are a great source of ideas, remember you can adapt a popular hair style to fit you and your personality.